Courtesy of AIRR Facebook page. 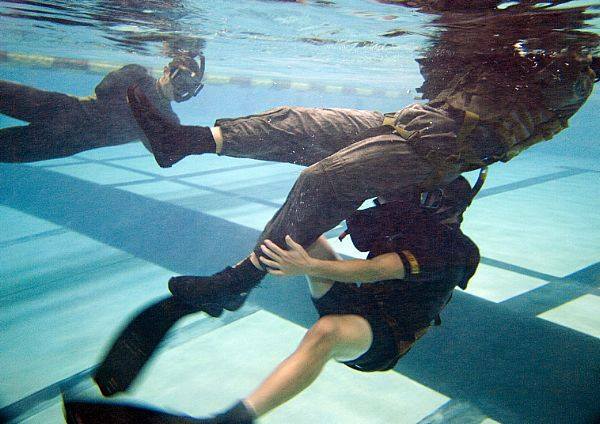 Hell Week is generally known from the 3rd week of SEAL training (BUD/S – Basic Underwater Demolition SEAL). Trainees are put through 5.5 days of rigorous physical, mental and emotional hell with only a few hours of sleep. In the end it’s not about the strongest person, but the ones that truly want it. Many other military training programs have unofficial Hell Weeks. There are several purposes to go through such tough training as it breaks you down (physically, mentally and emotionally) beyond what you ever imagined, but it also gives the instructors a check of who’s worth investing the time and money to take to the next level. High attrition rates are due to this intense type of training. If you’re going to quit halfway then you’re just putting yourself and others at risk, which could mean death out in the fleet. I like the concept for many of the same reasons. In Aircrew and AIRR (Air Rescue Swimmer School) we had weeks we called “Hell Week”, nothing compared to SEAL training, but it’s all relative. Most days were hell since we worked to the point of exhaustion before entering the water to conduct multi-victim rescues. In the end it was all worth the pain when the going got tough and we were able to perform in extreme situations. In mountaineering I’ve continued the same mind-set. It’s better to train hard and be miserable at sea-level than high on a mountain. It’s a part of working on the things you can control, since things out of your control (altitude, sickness, weather) will later test your true capabilities. Since I’m training for another Alaska mountaineering expedition I’ve decided to create a Hell Week in January to develop a baseline of fitness. You are welcome to join me, but make it your own regimen. We all have unique training programs so the last thing you want to do is force fit what I’m doing into your schedule. Come up with a training schedule that compliments your lifestyle, but pushes you beyond your limits. i.e. If you ride 20 miles a day then increase it to 40 miles and add some additional cross training. *Disclaimer – you’re doing this at your own risk so please ensure you’re physically and mentally capable. Safety and self-awareness is important to ensure you don’t injure yourself. Be sure to properly estimate your fitness ability prior to diving in over your head. Nutrition is very important with any workout. You burn more calories so you need to eat and drink more. It’s not an excuse to eat unhealthy food, but really hone your nutrition during this week to see how much better you feel. I tend to eat 3 balanced meals a day with lots of healthy snacks in between. Figure out what works for you and make it happen. The key to success is goal-setting, execution and discipline. Create a lifestyle with no excuses and complete each daily task. There will be times when you want to quit, but don’t. No excuses! We all have busy lives..adjust your schedule…power through it and enjoy the rewards! Post your regimen and daily accomplishments on Twitter using: #BDHellWeek I’ll do the same. I completely agree with everything in this article. My son has a hard time with electronics. It is a battle trying to teach him that there needs to be a balance between everything in life. It’s not easy, and I do admit I am guilty. Your examples of how to create such balances are wonderful and I will have my son read your page. I recently found your book on line and look forward to reading it. It was also nice to see that you are doing so well.